I have fond memories of coming home from school and opening the front door to the smells of Mother making sweet treats. 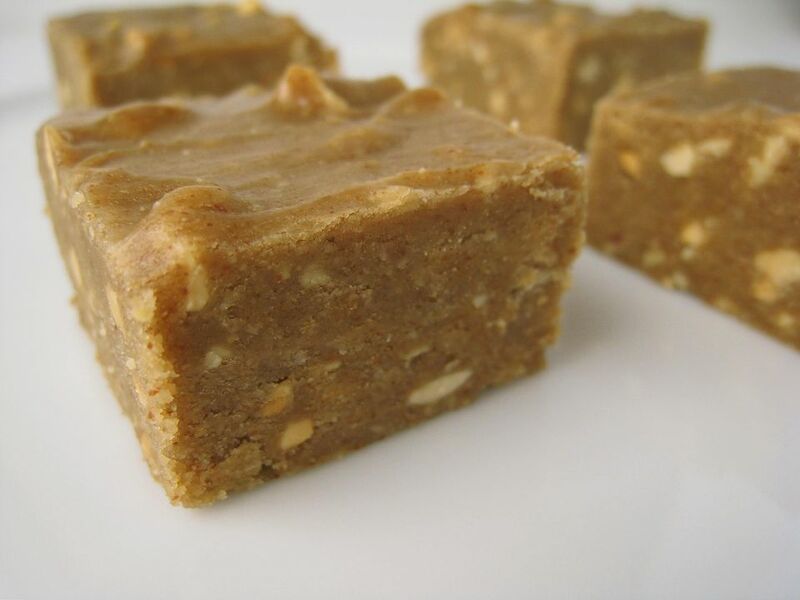 You just can’t mistake the aroma of freshly baked oatmeal cookies or homemade Peanut Butter Fudge. Mother made her Peanut Butter fudge the old fashioned way. It involved hot boiling sugar and a candy thermometer. I’m not saying there is anything wrong with the old fashioned way. It’s just that I don’t always have the time to go to that much trouble when this fudge tastes perfectly wonderful with less trouble. I will say that this kind of fudge has a grainier texture as opposed to old fashioned fudge. I’ve gotten to where I prefer the texture. I bet you will too. Besides being an easy recipe, it’s also Gluten-Free*. Line an 8 x 8 inch pan with aluminum foil. Be sure the ends hang slightly over the edges. Butter the foil and set the pan aside. Fill the bottom of a double boiler one third up with water. Bring it to a boil. Turn the burner down to low and place the top pan over the top of the double boiler. Melt the butter and the peanut butter in the top pan of the double boiler. Stir until completely melted. Stir in the powdered sugar. Stir until the powdered sugar had melted and the mixture is very smooth with no lumps. As soon this is accomplished, quickly scrape the mixture into the prepared pan. Use a spatula to smooth over the top. Once it is completely cool, remove the foil filled fudge. Place it on a cutting board. Peel down the sides of the foil. Cut the fudge into a least 16 pieces. If it’s during the warm weather months, store the fudge in the refrigerator. If it is not kept at least room temperature, the fudge will melt. This is one of those crazy recipes. Who would have thought that a dessert made with only 4 ingredients could taste so good. There are only 4 ingredients in this recipe. I make these peanut clusters at least once, but usually a couple of times, a year. The easy part about this recipe is that the clusters are made in a crockpot. These chocolate treats have names. My mother-in-law calls them Chinese Chews. I call them Chocolate Spiders, which makes them the perfect Halloween Party treat. It doesn’t matter what you call them, just make them. They are made with only 4 ingredients, and all you have to do is boil some water to melt the chocolate. To make sure this is a truly gluten-free dessert, be sure to carefully read the ingredient packages.